Chromatin immunoprecipitation is a method to isolate a protein of interest coupled to DNA following cross-linking with formaldehyde and to quantify the relative abundance or occupancy of the protein at specific genomic loci. After immunoprecipitation of protein–DNA complexes protein–DNA cross-links are reversed and the DNA is extracted. Various methods exist to identify binding sites and determine relative occupancy of the protein of interest; these include quantitative PCR, probing microarrays or sequencing the isolated DNA (ChIP-seq). 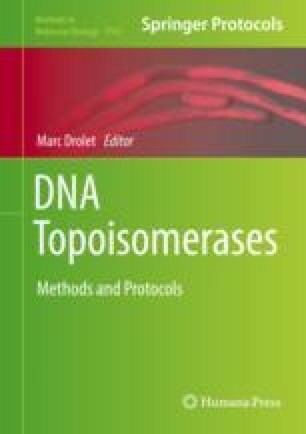 This chapter details the method of chromatin immunoprecipitation of TOP2 to the point of DNA extraction from the precipitated protein–DNA complexes.